Congratulations to Michael Ondaatje, whose 1992 novel The English Patient was awarded the Golden Man Booker Prize on Sunday, July 8. Ondaatje’s archive was recently acquired by the Harry Ransom Center and contains extensive materials relating to the award-winning novel. Ondaatje has an unusual writing process, which his archive documents clearly. He writes his initial drafts by hand in a series of notebooks, often inserting photographs, drawings, maps, poems, or clippings into the notebooks as he writes. His handwriting can be difficult to decipher, and he claims to be a slow typist, so he dictates his final handwritten draft onto an audio recording, noting all punctuation in the dictation. He sends the recording to a typist, who creates a computer typescript of the draft. Ondaatje then reviews the typescript, correcting any errors, and works through additional drafts on the computer, printing out the pages, editing them by hand, and revising the electronic files himself. Evidence of each stage of this creative process can be found in his archive. One of the notebooks containing the first draft of Michael Ondaatje’s novel The English Patient, with a clipping of the Libyan desert inserted, 1988. Michael Ondaatje Papers. The first draft of The English Patient fills four notebooks. 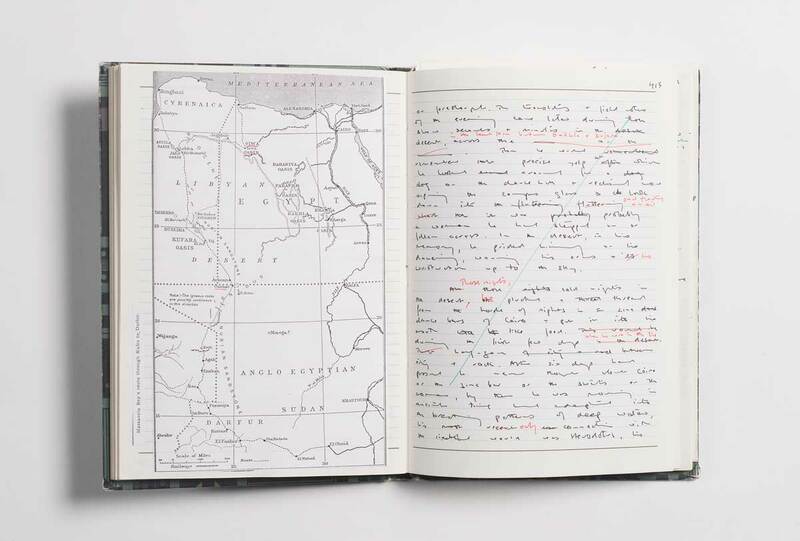 Throughout the notebooks, Ondaatje inserted images, quotes, and other clippings that relate to his writing, such as a map displayed here of the Libyan desert, an important setting in the novel. 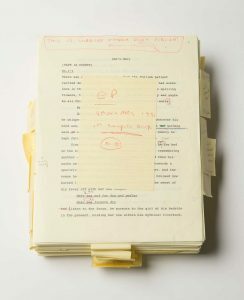 Also housed within the archive is a cassette tape containing Ondaatje’s dictation of his draft, a computer disk containing the typist’s draft based on the dictation, and hand-corrected printouts of the typescript, among other materials. The first typed draft of Michael Ondaatje’s novel The English Patient, 1991. Michael Ondaatje Papers. Also included in the archive is substantial documentation relating to the 1996 film adaptation of The English Patient, including correspondence between Ondaatje and the film’s director and screenwriter Anthony Minghella; letters from actors Juliette Binoche, Willem Dafoe, Ralph Fiennes, and Kristen Scott Thomas; publicity materials; and other documents relating to the production. The English Patient was the most highly honored film at the 69th-annual Academy Awards, receiving nine Oscars, including the award for Best Picture. These materials, and many others documenting Ondaatje’s remarkable literary career, are currently being cataloged at the Ransom Center. Austin residents will have the opportunity this fall to hear Michael Ondaatje read from his newly published novel, Warlight, on Thursday, October 18, at 6 p.m. in Jessen Auditorium, in an event co-sponsored by the Ransom Center and the Michener Center for Writers. 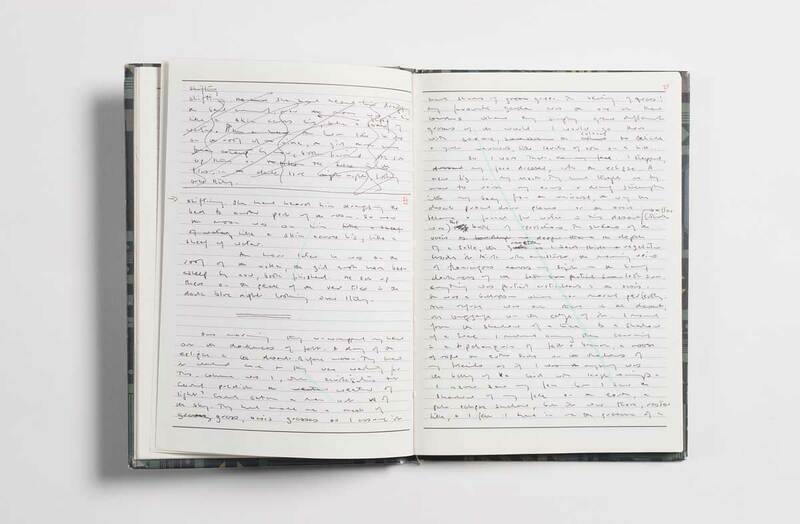 One of the notebooks containing the first draft of Michael Ondaatje’s novel The English Patient, 1988. Michael Ondaatje Papers. The Golden Man Booker Prize was awarded in celebration of the 50th anniversary of the Man Booker Prize, one of the most prestigious literary awards for fiction writing. A panel of judges selected a shortlist of five previous Booker Prize–winning books, one from each of the past five decades, and the public voted to select the winner. Among the five shortlisted finalists was Penelope Lively’s 1987 novel Moon Tiger, described by its nominee, poet Lemn Sissay, as “a unique book about a fascinating unpredictable woman way ahead of her time and yet absolutely of her time.” Lively’s archive is also housed at the Ransom Center. The English Patient was shortlisted for the Booker Prize in 1992. Fellow nominees that year included Ian McEwan and Barry Unsworth, whose archives are also part of the Ransom Center’s collections. In an unusual turn of events, the Booker Prize was awarded to two books in 1992, Ondaatje’s The English Patient and Unsworth’s Sacred Hunger, one of only two times in the prize’s history when a tie was awarded. The announcement of the Golden Man Booker Prize was the culmination of the Man Booker 50 Festival, a series of events featuring several Booker Prize–winning authors. As part of the festival, Michael Ondaatje participated in an un-moderated conversation with current Nobel Laureate Kazuo Ishiguro where the two authors discussed their creative processes and the influences that have informed their work. The archives of both authors are part of the Ransom Center’s collections, and they referred to specific items from their archives in their discussion. Other festival events featured Ransom Center authors Penelope Lively, Anita Desai, and Julian Barnes. 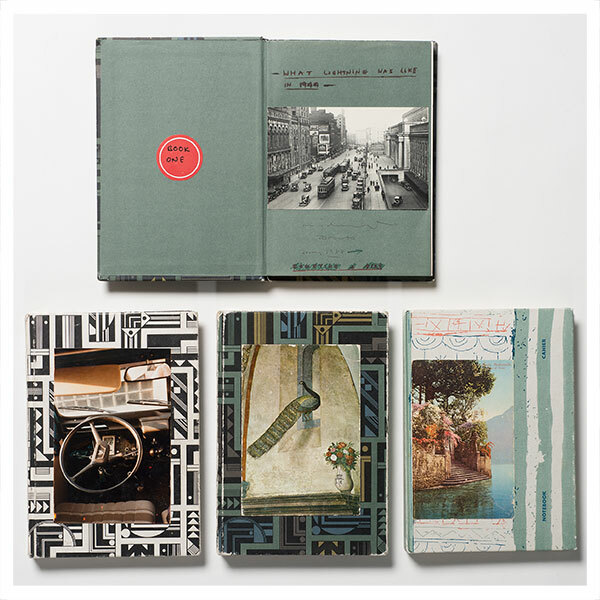 Top: Notebooks containing the first draft of Michael Ondaatje’s novel The English Patient, 1988. Michael Ondaatje Papers.